I was born and raised in Germany, but haven’t been living there in about 5 years. I love travelling and have been fortunate enough to see lots of countries and cultures. I have always been fascinated by language, which ultimately led to my studying Language and Communication at Swansea University. It was one of the two universities that accepted me and the degree was very flexible. I had also never been to Wales before, but always wanted to go, someday. Also because of the beach – but that wasn’t a major factor in my decision-making process! I enjoyed the flexibility of the degree. Each semester I was able to choose three English Language and three Media/Communication modules, which gave me the opportunity to study the specific areas I was interested in, such as ‘Discourse Analysis’ and ‘Corpus Linguistics’. There were some compulsory modules as well, but they made sense and I never felt like I was taking a module I didn’t need. I especially liked anything to do with discourse analysis. I didn’t like it at first, but by the time I had to hand in my final research project I loved it. Phonetics is also one of my favourite areas of linguistics. I got to study it from a British perspective and an American one, which was exciting. Corpus Linguistics is another topic I like quite a lot and I have used it as part of my methodology for my undergraduate dissertation and will continue to use it. I did a dissertation that resulted from a research internship with the Cyberterrorism Project. The overall aim of this internship was to analyse narratives brought forward by jihadist terrorist groups. We were a team of eight undergraduate interns with a PhD supervisor and a corpus linguist, who worked on different topics. In my dissertation I looked at how IS and Al-Qaeda construct “disbelievers” and how they legitimise their negative discursive construction of them. I used corpus linguistics to identify keywords and used a discourse analysis framework to analyse legitimation. As someone who spent a semester abroad, could you tell me about your experience? I did a semester abroad at California State University, Northridge (CSUN) in my second year. The courses I took were quite diverse. I ended up taking a marketing class, a journalism class and two linguistics classes, one of them was a very basic introductory class, and the other one was an upper division phonology class. The system in the US is quite different. You have more assignments that are spread throughout the semester, rather than one or two big assignments. I enjoyed my experience a lot and have definitely learned a few things, such as the American Phonetic Alphabet. I have just started studying for an MA in Language and Linguistics at Lancaster University. It’s a one year programme, so it does get very intense with reading, assignments and a dissertation. I am really enjoying it so far, though. How do you think the degree prepared you for your further study? My degree at Swansea provided me with all the skills I needed for postgraduate study. Especially choosing to write a dissertation at undergraduate level helps me a lot now. It doesn’t seem quite as daunting to have to write 12,500 words at the end of my masters, because I’ve already written 9,000 words for my undergraduate dissertation. It has also taught me to be very independent, which comes in handy. As far as plans go, I want to continue studying, which means doing a PhD after my MA. But I’ve learned that things don’t always go according to plan, so I’m keeping my options open and only have a vague idea of where I might end up. One option would be to stay in academia and go into research. Another option would be to try to find a job either after my MA or my PhD. There are two: Getting an 85 on the first assignment and the last assignment I ever handed in at Swansea University. It felt like I had come full circle and it was a great way to end my time at Swansea University. Really happy and proud. I was a bit nervous about tripping and falling on stage, because I can be quite clumsy sometimes, but luckily that didn’t happen. It was really great to have my parents and my sister there with me. 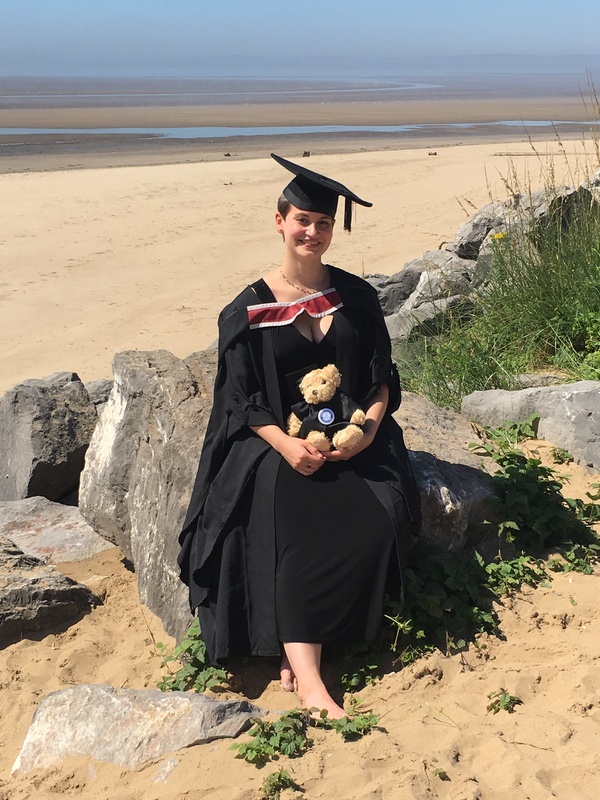 I loved the entire ceremony and the reception afterwards, because it was such a great opportunity to celebrate my achievements and say goodbye to Swansea. Every lecturer is very approachable and helpful. You can just go to their office hours and ask for help if you’re stuck on an assignment and they will do everything they can to help you. They’re also very knowledgeable and passionate about their subjects, which in turn inspires and motivates students. Try not to stress too much. I know that’s easy for me to say, because I’m not currently in my final year, but stress doesn’t get you anywhere. I am quite prone to worrying and being anxious and I spent the first semester of my final year constantly being sick. I had a bad cold that turned into tonsillitis and an ear infection. Take care of yourself and don’t just focus on your degree. If you’re doing a dissertation: start early. You don’t necessarily need to start writing it early, but read around your topic and start processing and thinking early. That way when it comes to actually writing it, it’ll be easier. Again, I would tell my first year self to worry a little less. Studying English language was everything I hoped it would be and more. I’ve never really thought about it, but I quite like the word “flabbergasted”. It sounds made-up and just shows how silly and fun the English language can be. ← Want to Know What We Did This Summer?